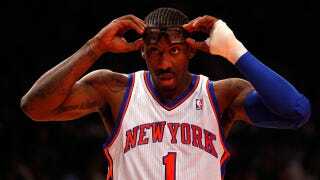 This past summer, the Knicks offered Stoudemire to nearly every team in the league - "available for free," as one rival executive put it. But they found no takers because of his diminished production, his health and his contract, which has three years and $65 million remaining (counting this season) and which is uninsured against a career-ending knee injury. In February, the Knicks wanted to send Stoudemire to Toronto in a deal for Andrea Bargnani, a person briefed on the discussion said. But the proposal was vetoed by James L. Dolan, the Garden chairman, before it ever reached the Raptors (who would not have made the deal anyway, team officials there said). Well, that's not very nice! The proposed Bargnani trade is actually less embarrassing than it sounds, as Bargnani was having a decent year before the all-star break last season. But "available for free" as recently as this summer? That's pretty cold, and not the kind of thing that is going to make Stoudemire's return to the Knicks any easier. Stoudemire has said that he would be open to coming off the bench when he returns, but it's hard to be a team player while also feeling unwanted. So enjoy the renaissance while it lasts, Knicks fans. Things could get ugly very quickly.